Hi, Becky here from Bite of Delight! 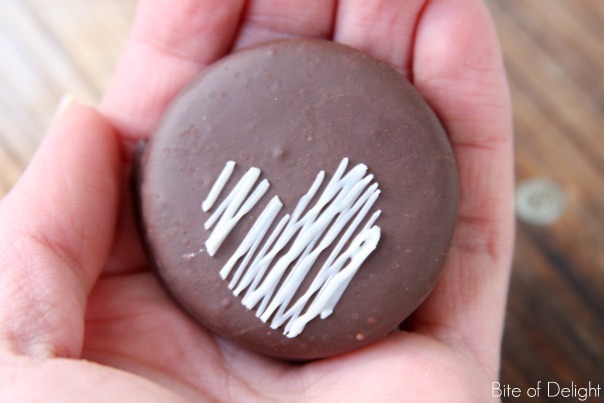 I’m excited to share these easy Chocolate Dipped Oreos with a White Chocolate Heart Drizzle…just in time for Valentine’s Day! It’s a fun and simple treat that’s easy to make and share with someone you love. 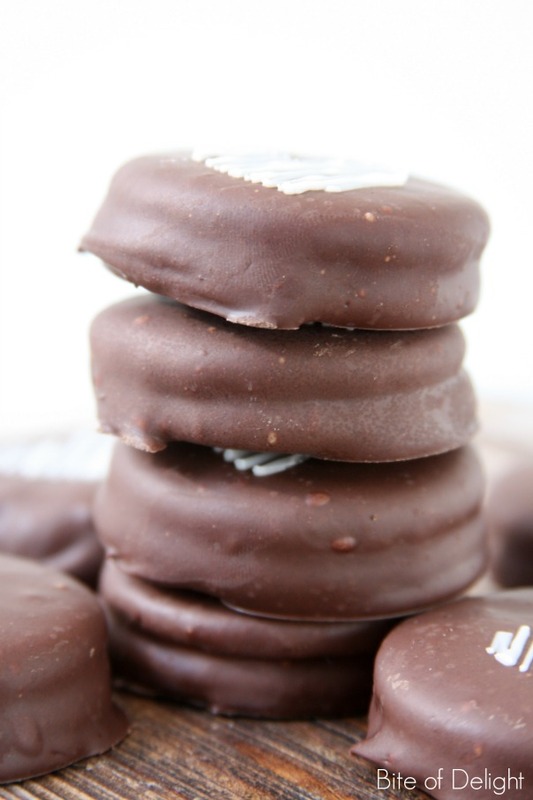 My kids loved these dressed up Oreos, and they’re even simple enough that you can have little helpers in the kitchen! Just dip the cookies, cut out the hearts, drizzle some white chocolate on, and you’re done! 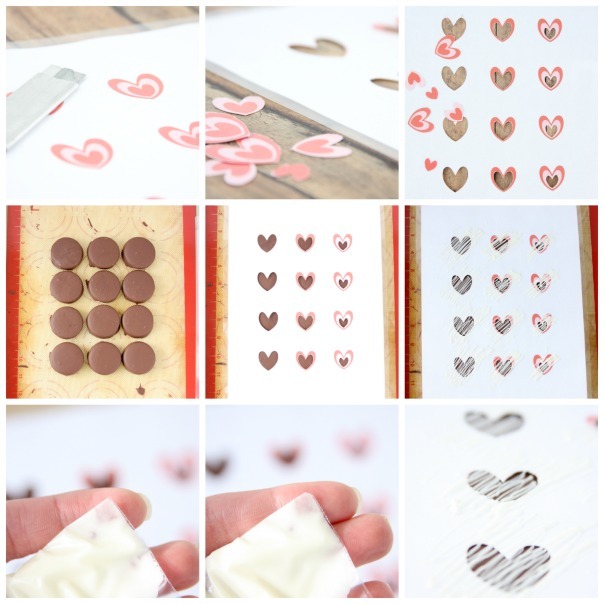 I created this little Hearts Printable to make the white chocolate drizzle into a heart shape. Just cut out the hearts with a sharp blade or X-acto knife. Choose from any of the sizes. I love the biggest heart! If you want to reuse the hearts for another batch of cookies, laminate it first for easy cleanup (and print it on vellum if you want it translucent, so you can see through it for easy cookie placement!). Oreos are quick and easy to dip. 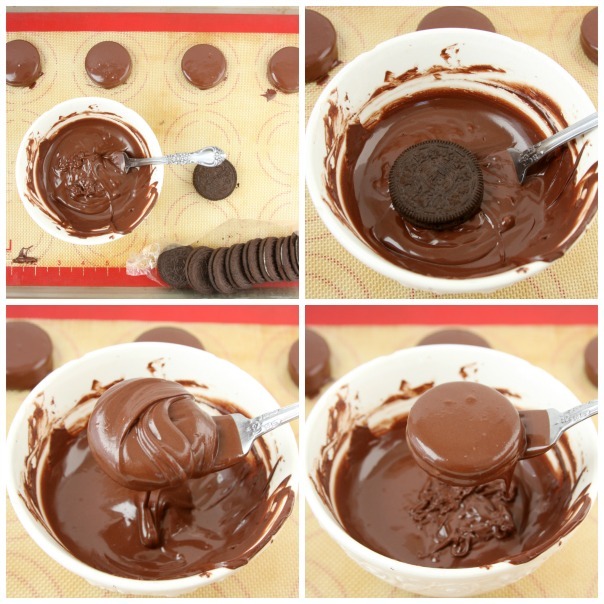 Just melt your chocolate, drop the cookie in and cover it with chocolate. To smooth it out and remove all that excess chocolate, gently tap the fork against the rim of the bowl. Once you’re happy with how your dipped cookie looks, you will still have extra chocolate on the bottom, so scrape it against the rim of the bowl to remove it. Then take a toothpick and push the cookie off the fork onto a silicone mat or parchment paper. Now just let the chocolate harden so you can add the fun heart accent! Print off the sheet of Hearts (remember to laminate if you want to reuse it for another batch), and cut out the hearts. I cut out one column of each size to show you how they looked, but my favorite was the biggest heart. If you do the smallest heart, just be sure to make sure the drizzled white chocolate touches the cookie…otherwise it won’t stick to the cookie, and it will lift off with the paper when you remove it. Place the melted white chocolate in a sandwich bag, snip a tiny piece of the corner off, and in a quick, steady back and forth motion, drizzle the white chocolate over the hearts. Remove the heart template as soon as you’re done drizzling the white chocolate. Melt chocolate chips over a double boiler or in the microwave, according to package directions. 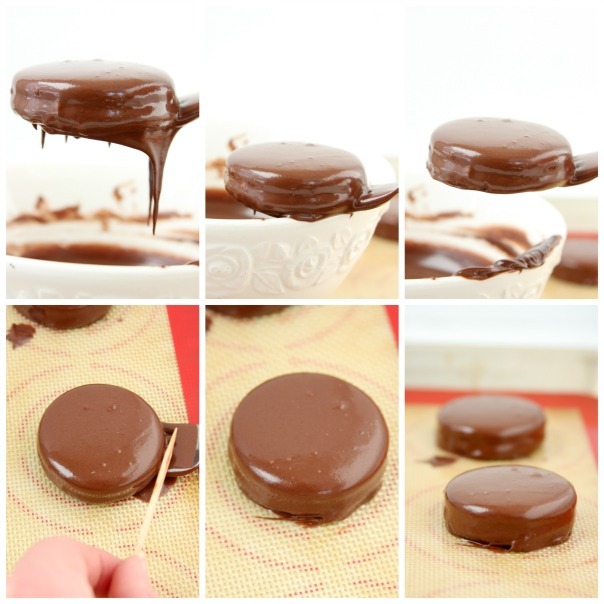 Dip cookies, one at a time, in melted chocolate. Use a fork to lift the cookie out of the chocolate and gently tap it against the side of the bowl to remove excess chocolate. Place on baking sheet lined with a silicone mat or parchment paper. Let chocolate harden. Place in the refrigerator for fifteen minutes, if you need it to harden faster. 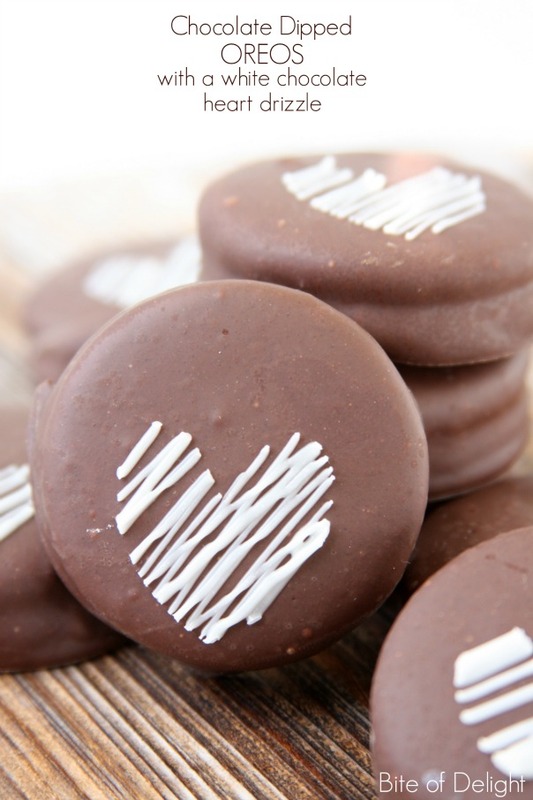 Once the chocolate is hardened, place the cookies close together (to match the hearts on the printable). Melt the vanilla almond bark according to package directions. Spoon into a sandwich bag and make a very small snip on one corner. Place the cut-out heart printable over the cookies and drizzle the white chocolate over the hearts, onto the cookies. If using the small hearts, but sure the bark touches the cookie, or else it won’t stick. Remove paper right away. Let white chocolate harden and share with someone you love! I use semi-sweet chocolate chips, but your favorite variety will work great.